As published in the Philippine Daily Inquirer, Sunday, December 14, 2014. Now that the P2.6-trillion national budget with redefined savings for 2015 has been passed by Congress, let’s roll with the theme of pork for our Christmas gifts! Here are a few suggestions for your pork-loving colleague or boss, or for that wacky Christmas party. But how do we get a taste of this famous Cebu lechon without flying in the whole pig? Entrepreneur Dexter Ding has come up with a solution. Ding hails from Cebu and his father loves lechon. Based in Manila, they were likewise faced with the challenge of satisfying Cebu lechon cravings. 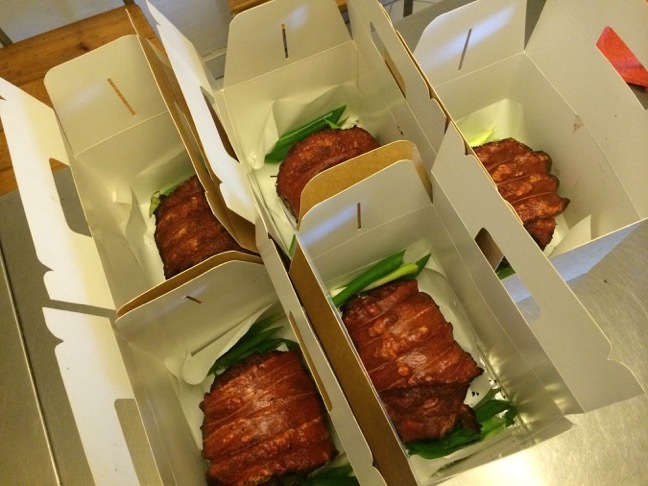 Not wanting to fly the entire lechon from Cebu all the time, Ding created Bai’s Boneless Lechon Cebu. These are chopped rolls of lechon, looking like a porchetta. However, all the delights of Cebu lechon are there: The beautifully crispy skin and the meat beautifully flavored with lemongrass and other Cebu lechon spices. Since it tastes just like Cebu lechon, there will be no need for lechon sauce or vinegar to go with it. Ding confesses, though, that the pork he uses is not local but comes from Canada (so think Canadian bacon). It has a very clean taste. Ding also makes sure that this is pork of the highest grade and with just the right amount of fat. A cut that is good for 10 to 15 pax is sold by the box. Call 0917-5825333 for orders. Imagine a chocolate chip cookie but, instead of chocolate chips, there are bacon bits instead. That’s what these cookies are like. It has all the sweet delights of a cookie but it is punctuated with bacon. Highly addictive! Order to believe it. Call 0917-7962731. 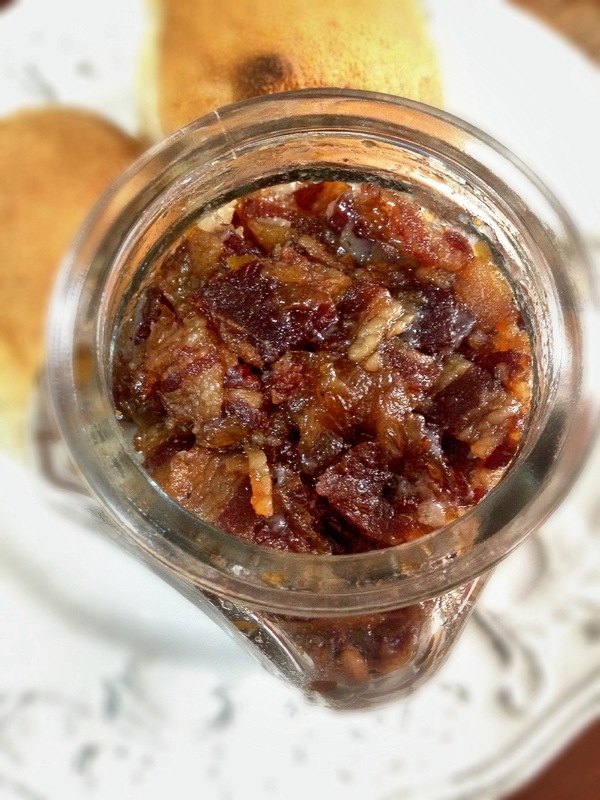 Daughter Aimee Fuentes, who now makes this and accepts orders, calls it Mom’s Famous Bacon Jam. No wonder it’s famous—this is pure indulgence in bacon. 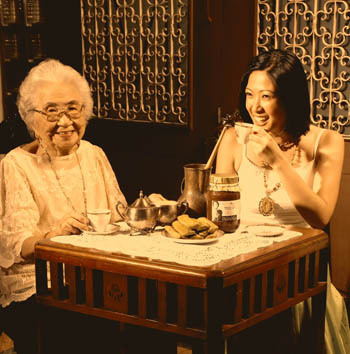 It’s a recipe of hostess with the mostest Bella Yuchengco. Aimee shares that they first tasted this when her mom served it with macaroni and cheese, and everyone’s been obsessed with it since. I had tried bacon jam before but, while it had the salty soul of bacon, it was still mostly just jam. Aimee’s version, though, has a lot of bacon. Each teaspoonful that you dig out of the bottle will offer you the deliciously salty crunch of itty-bitty bacon slices. Aimee shares that the recipe is really basic—she uses maple syrup and bourbon for the jam—except she doesn’t scrimp on the bacon. That makes a world of difference! I had mine with just scrambled eggs and later with toast. If you are a bacon lover, this is to die for! For orders, call 8077900. Chicharon—those sinful deep-fried slices of pork back fat. Little swirls of cholesterol heaven. Oh, the sound of that crunch as your teeth break the pig skin … music to the pork-lover’s ears! Don’t be chicken and have those weak, airy versions sold near the MRT. You might as well just have kropek. No, if you are going to have chicharon, get full back fat! This is the best chicharon in the country. Mabuhay ang Sta. Maria, Bulacan! For orders call 0915-8636262. For good ol’ cochinillo, my go-to is Cirkulo. Call 8102763 for orders. If they are swamped, as they usually are come Christmas time, try La Tienda on Polaris Street, Bel Air. Call 8904123. Bloggers have been all the rave for several years now about the lechon of Dedet dela Fuente, who calls herself the “lechon diva.” She had ovens customized in her backyard and she has become known for her stuffed lechon. Lydia’s also has lechon stuffed with paella. Dedet makes the stuffed lechon her signature, though, with her very creative stuffing. She goes “around the world” with a French stuffing of truffled rice; a German stuffing with apricots and chestnuts; a Chinese stuffing of machang; a Filipino stuffing of binagoongan; and the classic Spanish stuffing of paella. Her lechon is de leche and it’s really nakaka-leche in a delicious and delightful way. Call 0917-8660662 for orders. To my mind, it’s still the best lechon out there. Order it in the morning, the skin will remain crispy until your party at night with the fat glistening from underneath the crispy orange skin. Call 7317551, 7317552 or 7324116 for orders. Order early as even the biggest VIPs are turned down for orders come crunch time a few days before Christmas. I admit to myself that I really love Lechon especially from Cebu. This is a dream come true that you can eat one’s heart out of a roasted pig. This is really perfect! 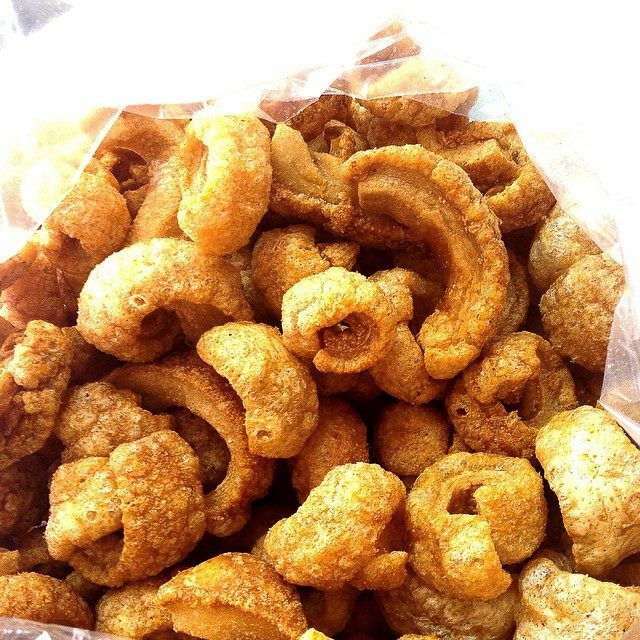 The look of chicharon is mouthwatering. I can already hear the crunch on every bite!